hutongs are a type of narrow street or alley, commonly associated with northern chinese cities, most prominently beijing. 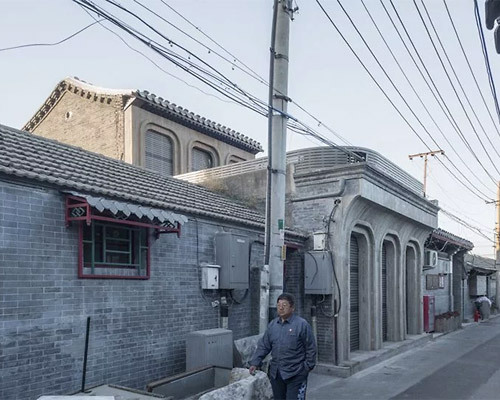 recently, a growing number of hutongs are being renovated by contemporary chinese architects in order to house new programs. 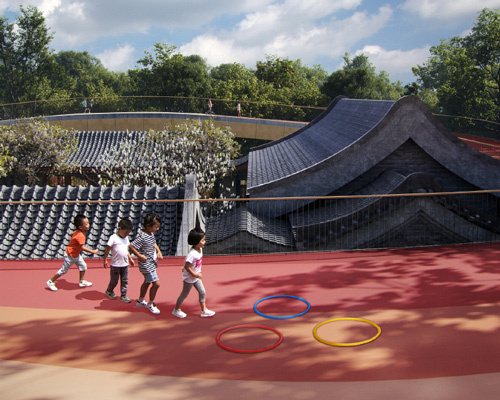 the canopy transforms the space between the buildings into a colorful setting that functions as an outdoor playground. resembling a vast container letting in the sky, wind, sunlight, air, and sound, the space with two trees in the middle features translucent rooms along the perimeter hosting all the necessary facilities. the architects have adopted a light and flexible approach, retaining memories of the site and keeping the dynamics of the city and the street while refining the main structure. the new structure opens up never-before seen perspectives, allowing the visitor to interact with the traditional architecture in unconventional ways. 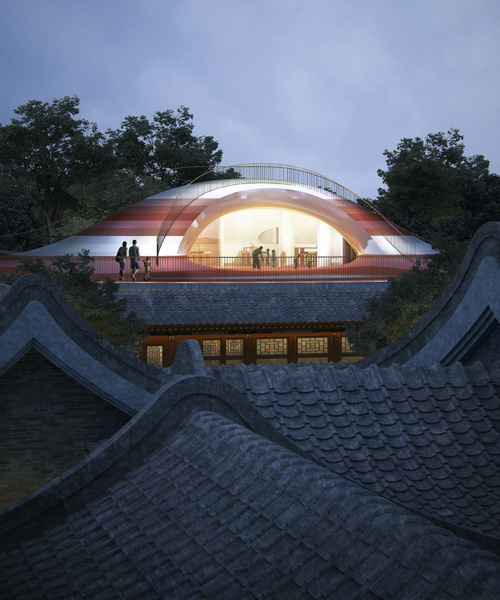 occupying slightly more than 500 sqm, the structure is located in a noisy hutong area. the studio's efforts form part of a phenomenon seeing contemporary architects breathe new life into these graceful houses, which since the 1950s have been threatened by the country's rapid modernisation. the refurbished house has been designed to accommodate three generations. chaoffice's strategy was to maintain the original structure on its original boundaries, in order to keep the relationship between house and environment. the hotel compound sits on the edge of the picturesque houhai lake, and neighbors a verdant public park, as well as historic hutong houses used by local inhabitants today. initially, this renovation project started with two traditional houses and one privately-built house. the characteristics of traditional hutongs have been disappearing along with the population expansion and additional construction in the city. based on the existing layout of the courtyard, the undulated floor is used to connect indoor and outdoor spaces of different heights. the interiors are brushed with deep, earthy colors that are met with contrasting effects of light and darkness. three separate building installations turned this dark, cramped house into a bright and aerated modern home. the scheme replaces part of a previously existing dwelling and adds new functions such as a kitchen and bathroom. the tenement has been renovated to comfortably house a family of three generations; all within the space of 24 sqm. measuring at only 43 sqm, clever space-saving methods and flexible furniture has been used to create a functional and comfortable home for the family. hidden from the street, extruded volumes with floor-to-ceiling glazing project outwards into a centrally positioned courtyard. 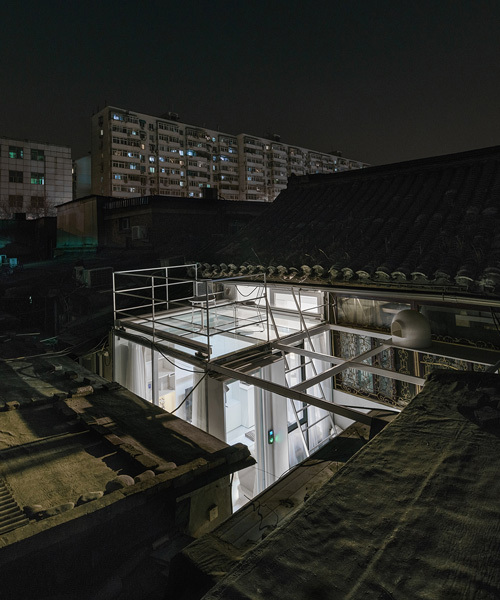 the architectural intervention at beijing design week focuses on creating a spatial event that enables a socio-political one. 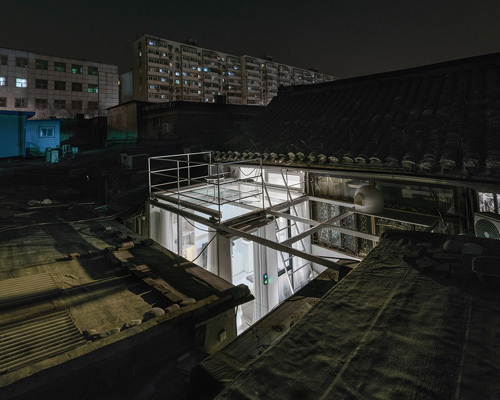 the 150 sqm courtyard was renovated into a co-existing space, demonstrating architectural techniques that can be used to shape and improve these traditional settlements. 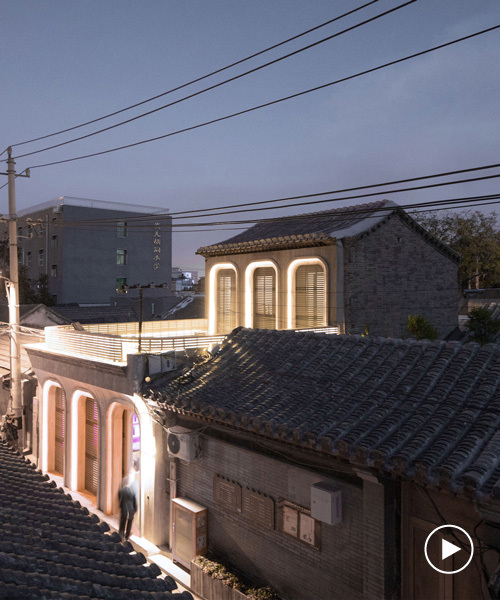 the transformation of the traditional hutong typology aims to generate an adaptable space able to match our new lifestyles through the creation of an experiment on scale and construction.